TelcoBridges 1+1 and n+1 features answer the need for maximum reliability, offering a redundant gateway to ensure high-availability, that exceeds five nines availability (99.999%). In a 1+1 solution each standard (active) unit is backed by a secondary (standby) unit. In the case of an n+1 solution, a group of standard (active) units can be backed by a single secondary (standby) unit. For additional information regarding our n+1 solutions please contact us and one of our trusted advisors will help you. When properly installed and configured, the standard gateway unit acts as the primary (active) VoIP gateway and the +1 gateway unit acts as the secondary (standby). The two are controlled through the connection of the VoIP ports 0 and 1. In the event of product malfunction and without the need for human intervention, traffic is transferred from the active to the standby unit through the patch panel connection. 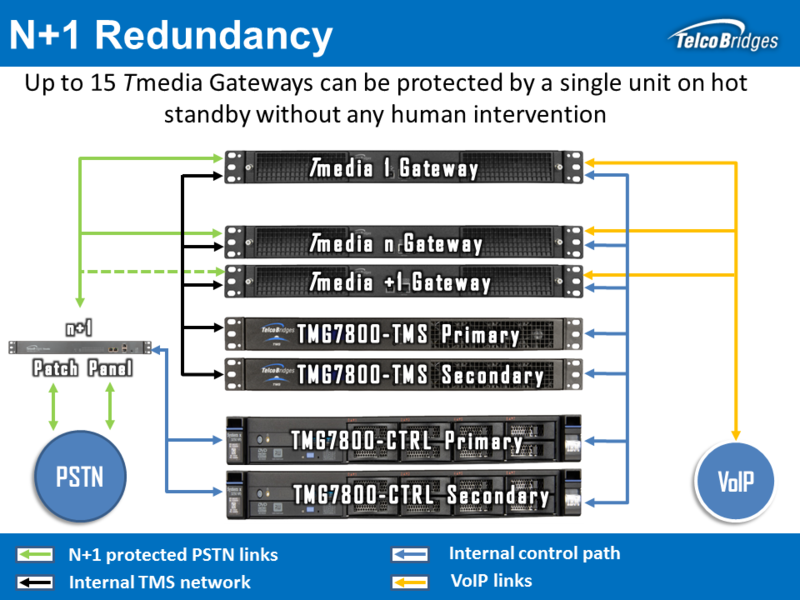 Our clients are looking to ensure that their VoIP gateways are as infallible as their TDM networks, and TelcoBridges' redundancy features provides that high level of redundancy and high availability that they need to lead. To ensure complete protection, TelcoBridges recommends the purchase of a spare unit to go along with your redundancy solution (eliminating any potential shipping delays). And a 1+1 patch panel. *When you purchase the +1 standby unit, the 1+1 patch panel(s) come included in the package. It is important to note that with the purchase of your +1 standby units comes its associated patch panel(s) and cables. If you are interested in TelcoBridges 1+1, or n+1 solution, please contact us today and a TelcoBridges trusted advisors will help you evaluate the best system set-up to ensure the highest level of redundancy possible! For additional information regarding our n+1 solutions or our 1+1 solutions for our Tsig or Ttrans products please contact us and one of our trusted advisors will help you.